Step 1 Heat the oven to 400 degrees. To roast the garlic, cut off the top one-half inch of the garlic head to make a "lid." Drizzle the cut surfaces with a little olive oil and season with a pinch each of salt and pepper. Replace the lid. Wrap the garlic in foil and place on a baking sheet. Roast until the garlic is tender and a rich golden color, about 45 minutes. Unwrap and cool. The garlic can now be used for the soup, or wrapped in plastic and refrigerated until ready to use, up to 1 week. Step 2 Meanwhile, cut the florets from the broccoli stalks. Coarsely chop the florets, then peel and coarsely chop the stalks. Step 3In a large saucepan over medium heat, melt the butter, then add the onion and cover with a lid. Cook, stirring often, until the onion is tender, about 5 minutes. Stir in the chopped broccoli and potato. Step 4Add the broth and bring to a boil over high heat. Reduce the heat to low and partially cover the pot. Simmer until the potato is very tender, about 30 minutes. During the last 5 minutes, squeeze the roasted garlic into the pot, discarding the hulls. Season to taste with salt and pepper. Step 5Puree the soup in batches using a blender, or in the pot using an immersion blender. Serve hot. This makes about 2 1/2 quarts soup. In Recipes-list.com we have selected the most viewed recipes from category - Healthy eating Soups Vegetarian . Enjoy the best recipes specially selected for you! 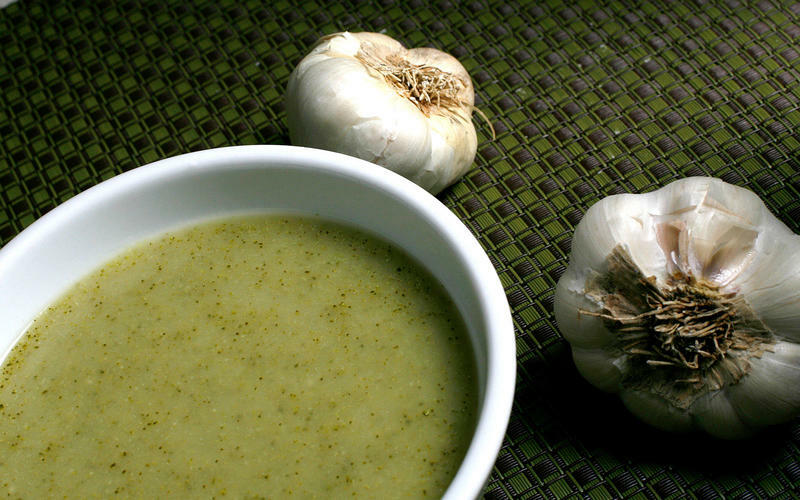 Broccoli and roasted garlic soup is the right choice that will satisfy all your claims.